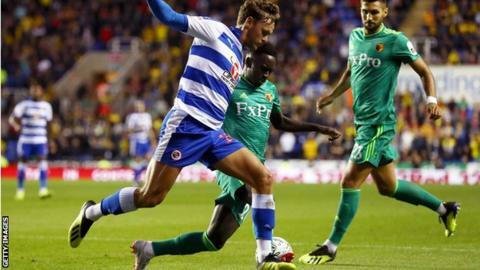 Domingos Quina scored a stunning goal on his Watford debut help them progress to the Carabao Cup third round at the expense of Championship side Reading. Nigeria striker Isaac Success, one of 11 changes made by boss Javi Gracia, opened the scoring for the Premier League side from Adam Masina's cross. Portuguese midfielder Quina added a second after half-time with a crisp long-range strike. Marc McNulty had Reading's best chance but lifted a shot over the bar. The victory maintained Watford's winning start to the season as Gracia gave some of his fringe players a chance to impress. Neither side showed much adventure early on, although Chris Gunter's low cross tested Watford goalkeeper Heurelho Gomes. Watford responded with an ambitious 35-yard free-kick attempt from Marc Navarro, which Reading goalkeeper Sam Walker gathered easily. Nathaniel Chalobah, Adrian Mariappa and Ben Wilmot wasted opportunities for Watford but Reading should have gone ahead soon after. Gunter again crossed nicely from the right and McNulty, after he neatly controlled, blazed over the crossbar. It proved costly when, just after the half-hour mark, Masina escaped down the left flank and crossed for Success to wrong-foot Walker before he tapped into the empty net. It was the Nigerian's second goal for the club and first since October 2016. Reading offered little in response and Watford secured passage when Quina unleashed a superb 30-yard drive past Walker. Reading boss Paul Clement: "The manner of the defeat is disappointing. I think we can do a lot better than that. "When four, five, six players are not having their A-game, it becomes a big test. "In the end it was a comfortable victory for them. And there's no doubt we made a lot of mistakes." Watford manager Javi Gracia: "We had a good performance with players who haven't played so far. "They enjoyed their first match today, and we want to play more matches in this competition. "Our target is to win all the games in the Premier League and the cups." Match ends, Reading 0, Watford 2. Second Half ends, Reading 0, Watford 2. Marc Navarro (Watford) is shown the yellow card for a bad foul. Andy Yiadom (Reading) wins a free kick on the left wing. Foul by Marc Navarro (Watford). Foul by Stefano Okaka (Watford). Yakou Meite (Reading) wins a free kick in the defensive half. Yakou Meite (Reading) is shown the yellow card. Substitution, Watford. Will Hughes replaces Nathaniel Chalobah. Attempt saved. Yakou Meite (Reading) left footed shot from outside the box is saved in the top right corner. Foul by Sebastian Prödl (Watford). Attempt blocked. Liam Kelly (Reading) right footed shot from outside the box is blocked. Attempt blocked. Marc McNulty (Reading) right footed shot from the left side of the box is blocked. Josh Sims (Reading) wins a free kick in the attacking half. Attempt saved. Marc Navarro (Watford) right footed shot from the centre of the box is saved in the bottom left corner. Substitution, Watford. Abdoulaye Doucouré replaces Domingos Quina. Corner, Watford. Conceded by Josh Sims. Attempt missed. Liam Kelly (Reading) right footed shot from the centre of the box is high and wide to the right. Domingos Quina (Watford) wins a free kick in the attacking half. Foul by Domingos Quina (Watford). Attempt missed. Stefano Okaka (Watford) header from the centre of the box is close, but misses to the right. Foul by Liam Kelly (Reading). Nathaniel Chalobah (Watford) wins a free kick in the defensive half. Adrian Mariappa (Watford) wins a free kick in the attacking half. Corner, Reading. Conceded by Marc Navarro. Tiago Ilori (Reading) wins a free kick in the attacking half. Foul by Nathaniel Chalobah (Watford). Substitution, Watford. Stefano Okaka replaces Ken Sema. Substitution, Reading. Sam Baldock replaces John O'Shea.